Gertrude (nee Hubing) Fieber died late Wednesday evening, October 12, 2016, at Harbor Cove in Port Washington, of natural causes at the age of 97. Gert, as she was known, was born on June 29, 1919 to John B. and Sylvina Rach Hubing. She was the third of their fourteen children. She married Edward J. Fieber on September 6, 1947 at St. Nicholas Catholic Church in Dacada, WI. The couple settled in Dacada and started their family. Mrs. Fieber worked as an inspector at Power Products until she retired in 1974. The couple enjoyed wintering in Tucson, AZ before Edward preceded her in death in 1979. In 1985 Gert moved to Port Washington. She loved her family and friends and enjoyed playing Sheepshead, square dancing and making ceramics. Gert was a long-time member of the Ladies Auxiliary VFW Ozaukee County Memorial Post #5373 and American Legion Auxiliary Post #82. She enjoyed selling poppies, preparing & serving food at the Veterans boat outing in Port Washington, and was a member of St. Mary’s Catholic Church in Port Washington, St. Mary’s Christian Women’s Society, St. Vincent DePaul Society and the Good Samaritan Guild. Gert is survived by 5 children: John (Marie) Fieber of Port Washington, Marilyn (Tom) Berlin of Sheboygan Falls, Joseph (Melinda Carter) Fieber of Columbia Heights, MN, Phylis (Terry) Gencius of Kewaunee, and Joyce (Dennis) Kenealy of Erin. She is further survived by son-in-law Terry (Corinne) Demler of Sheboygan Falls, 14 grandchildren, 17 great-grandchildren, brother Gerald (Arlene) Hubing of Belgium, sisters Kathleen (the late Kenneth) Bares and Mary (the late Eugene) Bares, both of Belgium, sisters-in-law Eleanor (the late Joseph) Hubing and Sandra (the late Melvin) Hubing of Belgium, numerous nieces & nephews, other family and many friends. She is preceded in death by her husband Edward, daughter LuAnn Demler, sons-in-law John Walsh and Jim Avery, 7 brothers: Emil (the late Camilia), Donald (the late Harriet), Robert (the late Lucille), John (the late Elaine), Norbert (the late Esther), Melvin and Joseph Hubing, 3 sisters: Agnes (the late Frank) Bahr, Regina (the late Fred) Augustin and Genrose (the late Alex) Brabender, brothers-in-laws Ben, Lawrence, and Henry Fieber, Clarence (the late Adeline) Fieber, and sisters-in-law Julia (the late Peter) Puerling and Rose (the late Joseph) Molling. Mass of Christian Burial will be held at 6PM on Wednesday, October 19th at Our Lady of the Lakes Parish, St. Nicholas Chapel, Dacada. Father Todd Budde will preside. She will be laid to rest beside her husband in St. Nicholas Cemetery in Dacada the following day. The family will receive visitors on Wednesday at the CHURCH from 3-6PM. The Eernisse Funeral Home is assisting the family with arrangements. Online condolences may be left at www.eernissefuneralhome.com. Memorials in Gert’s name are suggested to St. Vincent DePaul Society or American Heart Association. The family wishes to extend thanks to Nancy, Amy, Stephanie, Lisa and all of the staff at The Cove in Port Washington for their compassionate & loving care of Gert and her family. 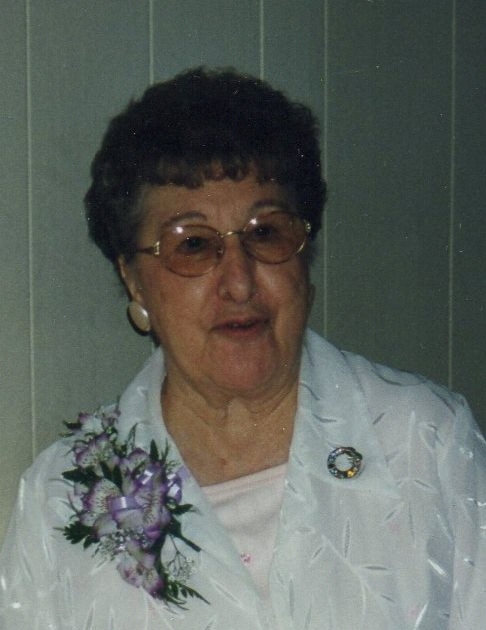 To send flowers or a remembrance gift to the family of Gertrude M. Fieber, please visit our Tribute Store. "Email Address" would like to share the life celebration of Gertrude M. Fieber. Click on the "link" to go to share a favorite memory or leave a condolence message for the family.